Stand in front of the concave mirror. Notice that the reflected image is reduced and inverted. Now move closer. What do you observe? Now stand in front of the convex mirror. What do you observe? A concave mirror has an inward curved surface, like the inside of a spoon. Because of a concave mirror’s curved shape, light rays are focused at a point in front of the mirror’s surface. Depending on where an object is placed, a concave reflecting surface can reduce and invert an image, or enlarge an image. Concave mirrors are often used as vanity mirrors to enlarge a person’s face. An outward bulging reflecting surface is called a convex mirror. A convex surface only reduces the size of a reflected image; it does not invert it, regardless of where an object is placed in front of it. Convex mirrors focus light rays behind the surface of the mirror, or inside of it. Convex mirrors are often used in convenience stores for security purposes, or on the passenger side of automobiles to provide a wider view. 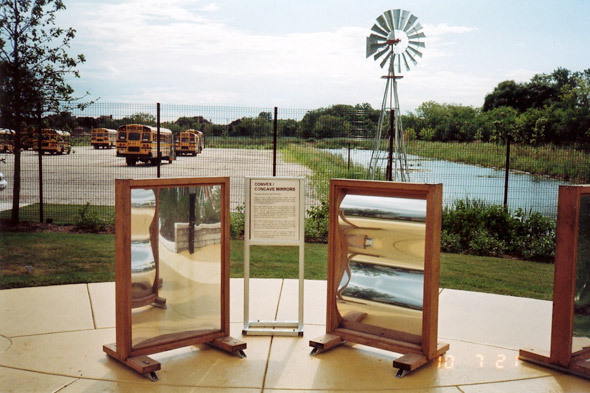 Concave mirrors are used in reflecting telescopes.